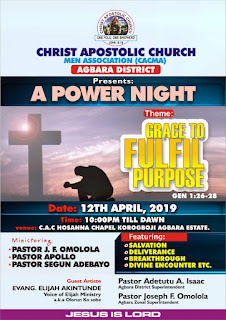 Christ Apostolic Church Men Association (CACMA), Agbara District, Agbara Zone, will today Friday April 12, 2019 holds "Power Night" programme. The theme of the programme is "Grace to Fulfill Purpose" and it starts by 10pm at CAC Hosanna Chapel, Korogboji, Agbara Estate. 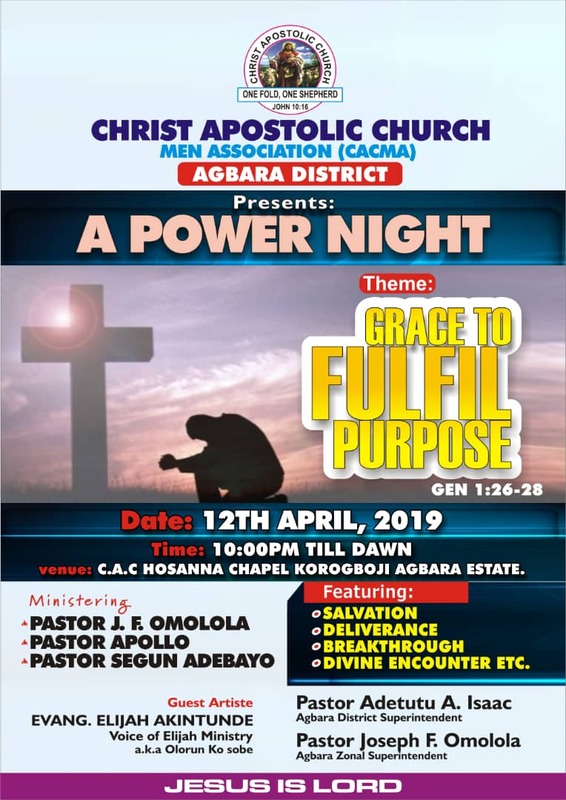 The District Superintendent of CAC Agbara District, Pastor Adetutu A. Isaac told CAC NEWS that the programme is specially organized to open the understanding of men to their responsibilities as husbands, fathers, leaders and children of God regarding those responsibilities as divine purpose. While commenting on the theme of the programme which is "Grace to Fulfill Purpose", the Cleric said:" grace to fulfill purpose was chosen in order to enable our men rely totally on God. We want them to believe that nobody can be anything without divine assistance and all responsibilities are easily attained through divine help." He said at the end of the programme men present at the programme would be able to realized the purpose of their creation and receive power to fulfill them, adding that failure in all forms will be over and testimonies will replace reproach. Evang. Elijah Akintunde of Voice of Elijah ministry is the special guest.